Sadie has a new saying that she says every night before she falls asleep. After she says her prayers she whispers: "Mommy. I am Saint Therese of the Child Jesus. And Mae Bae is Sister Scholastica!" To which I whisper: "Saint Scholastica... she was a saint!" And then Sadie whispers back, "I am Saint Therese of the Child Jesus! And Mae Bae is Saint Scholastica!" before falling asleep. But I can just imagine how that would unfold... with Sadie trying to force Mae Bae to wear a veil. And Mae Bae trying to put her veil on me. 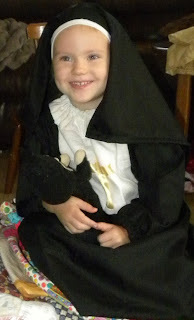 Which would be followed by Sadie following me around her house saying: "Mommy can you make Mae Bae wear her nun outfit? Mommy, Mommy, Mommy..."